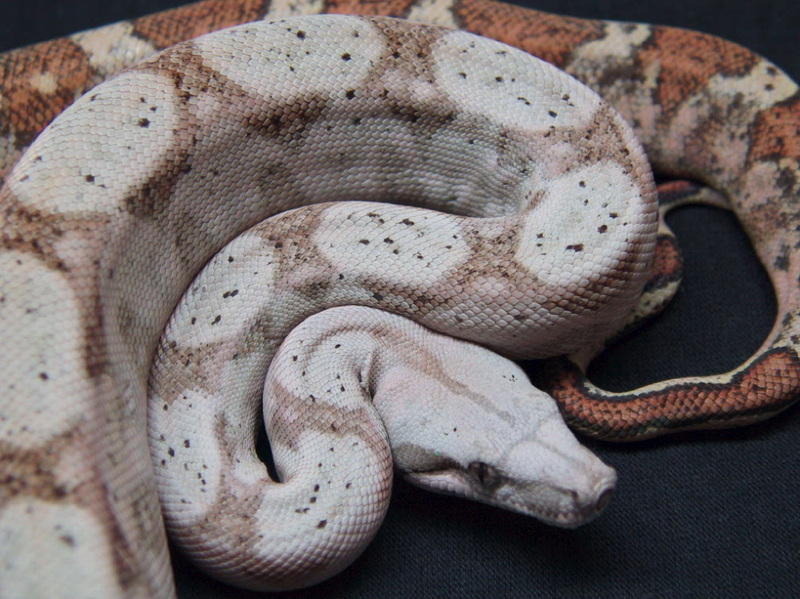 There are two subspecies of Boa constrictor that are readily available in the pet trade today. The first are the True Red-Tailed Boas (Boa constrictor constrictor) of the Amazon Basin countries of Guyana, Surinam, Brazil & Peru, South America. These True Red-Tailed Boas are the largest of the constrictors and average adult size could be as long as 12 feet. The second subspecies is the Colombian or Common Boa Constrictor (Boa constrictor imperator) found from Colombian, South America and North into Central America & Mexico which averages a smaller adult size of around 7 feet. There are also a few Island morph Common Boas (Boa constrictor imperator) that are much smaller than their mainland cousins. 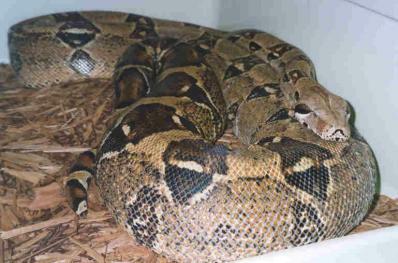 These Boas average an adult size of around 4 - 5 feet in length. Some of the island types boas available to the pet trade today are Hog Island Boas, Caulkers Cay Boa, Corn Island Boa & Roatan Island Boas. 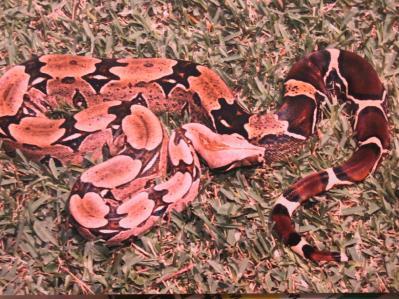 All of these boas inhabit tiny islands off the coast of Central America and are much smaller & easier to handle. Thus, they make far better choices as pets. 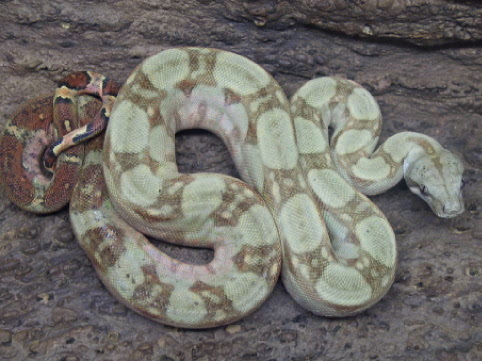 Due to their medium adult size, Boas make excellent captives. You can maintain adults in 3 - 6 foot long enclosures that are 24 inches deep and 18 inches high (depending on the size of your Boa). You can also use an appropriately sized Aquarium with a Screen Top that locks. The cage should have an appropriate sized heat pad underneath the unit that is connected to a thermostat and set to 90 degrees. Since Boas have a more arboreal habit, they may be kept in higher enclosures with branches to climb and a Heat Lamp with a low wattage bulb. The ambient air temp should be around 83 degrees in summer and around 72 in winter. Boas will need to Thermoregulate their body temperatures. So make sure that they can get off or away from the heat in their cages. Place the Heat Lamps or Heat pads to one side of the enclosure. 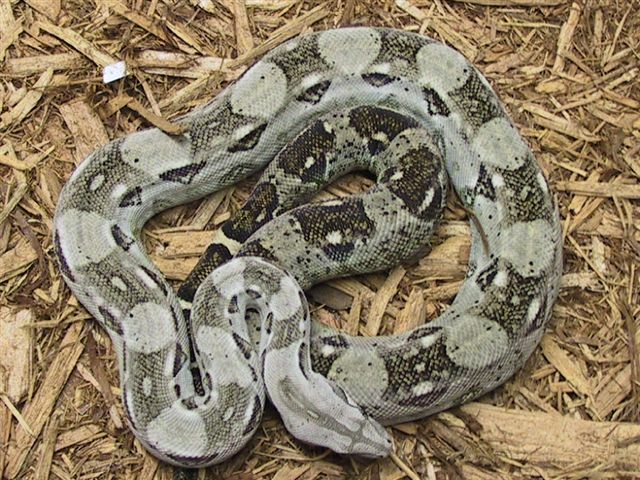 Adult boas are maintained on a small to medium rat every 2 weeks during the summer and usually fast during the winter months. 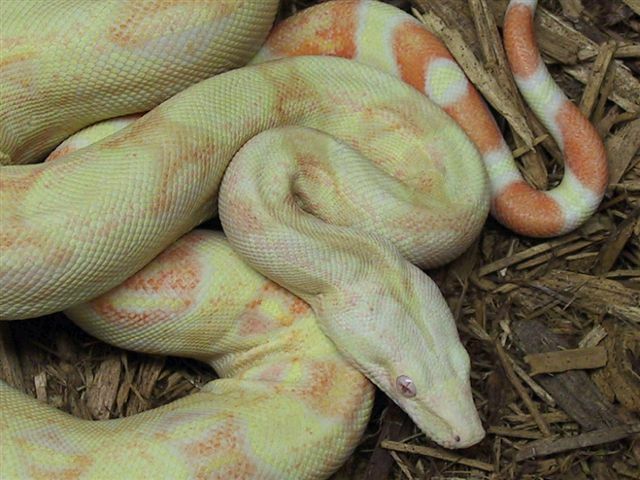 Young Boas should be fed a hopper mouse or crawler mouse every week to 10 days. Fluorescent lighting may be used (but is not necessary) and set on a timer for a 12 hour on / off schedule. The Heat Lamps (if used in conjunction with a heat Pad) can be used for lighting / heat and should be on the same 12 hour on/off schedule. A bowl of fresh water is a necessity. Water is used for drinking and as an aid in the shedding process. The bowl should be big enough for the Boa to get into & soak. Since Boas are Rainforest creatures they should have this available to them at all times. The larger water bowl will also increase humidity as well. Boas should be misted every few days in summer & less often in winter. Captive bred individuals are the choice here. These make better pets than wild-collected or farm raised animals. Juveniles are also preferable to adults. Try to handle the snake before you buy it. If you can see the snake feed, so much the better. Check the snake for clear, bright eyes and a smooth muscular body. Never buy a snake that is shedding. Wait until after the shedding process is done. The nasal passages should be clear (no mucus or bubbles) when the snake breathes. Be sure to check for mites (small parasitic animals that feed off the snake). Handle the snake often, but never after you have just fed it or if you have a mouse/rat scent on your hands or when they are shedding. If you have additional questions about boas try to attend one of the LIHS monthly meetings. You can e-mail us at info@lihs.org or write or call the LIHS at the address/phone number at the top of this sheet. Try to read a book on the animal you intend to buy.